Back in 2004, Mariachi Los Changuitos Feos celebrated its 40th anniversary. 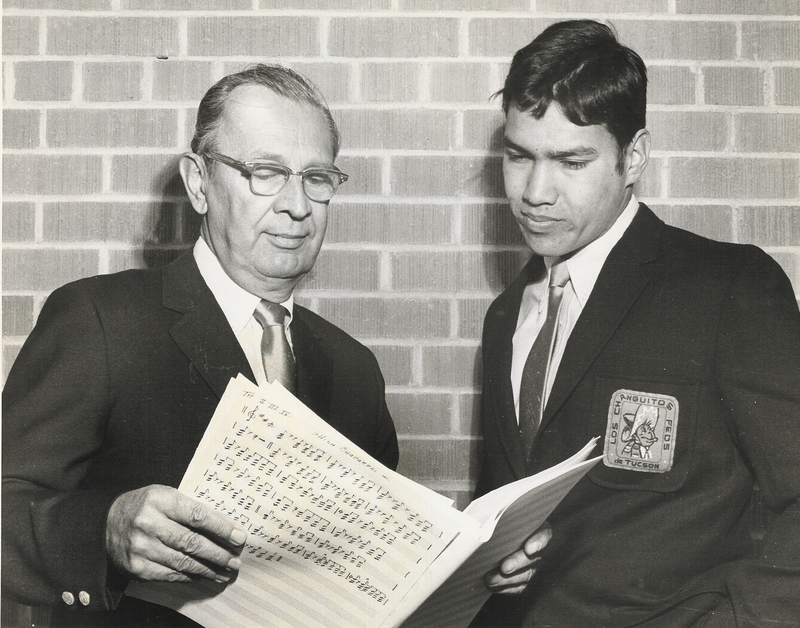 Randy Carrillo, right, goes over music with Los Changuitos Feos music director Art Pepin in the late 1960s. I created some video content for the Tucson Citizen at the time to tell the story of America’s longest continuously active youth mariachi, and to document the group’s 40th anniversary celebration. The videos include clips with Monsignor Carrillo, whose enthusiasm for mariachi music inspired Father Rourke to start Mariachi Los Changuitos Feos; the families and members of Mariachi Cobre talking about a variety of Changos experiences, Joel Valdez talking about the idea to create college scholarships for the young mariachis, performances by Mariachi Cobre, and what would turn out to be the final performance of the father of Chicano music, Lalo Guerrero. In 2014 the group will celebrate 50 years in action. This group has in so many ways to Tucson’s transformation, in part from the travels it took, from its notion of creating college scholarships, and from the accomplishments of its many graduates. Origins of Tucson youth group Mariachi Los Changuitos Feos, and memories of its members of places the group traveled. Family members of early participants in Los Changuitos Feos talk about the early days of Tucson’s first youth mariachi. Highlights from the 40th anniversary celebration of Mariachi Los Changuitos Feos. ~ by Daniel Buckley on September 30, 2013.